The best sort of demos make you intrigued about what the game has to offer. The worst get you bored with the concept. Last week’s candidate was a demo for something that I wouldn’t call good, but it also wasn’t something I’d call bad. I felt like after taking my time, the demo left me with a good sense of what the game would play like, but also left enough blanks in the picture that I didn’t feel I could entirely satisfy any cravings simply through the demo. It was solid, it teased, it made its central hook known. Jagged Alliance – Back in Action does not have a particularly good demo. In fact, what it has is a stilted tutorial and a single mission that both manage to remind me of why I long considered PC gaming to be far more tedious than it needs to be. And from research, it’s not really the fault of the franchise, but a combination of a developer doing a poor job of adapting a game and the demo doing an even poorer job of making the game seem enjoyable. The Jagged Alliance series has a long and storied pedigree, one that I really haven’t been party to. The concept is solid enough, though; you take command of a group of mercenaries, tasked with acting as a paramilitary strike force in various nations, using the same sort of locational ambiguity that writers always use when a combination of tinpot dictators and lots of guns feel appropriate. There’s a great deal of humor, character traits, and the whole thing generally looks like a version of G.I. Joe that’s less about off-the-wall crap and more about lots of dudes shooting each other amidst one-liners. You know, like every reboot of G.I. Joe has tried to be. In terms of gameplay, the classic games were very much in the vein of XCOM, which I’m sorry to admit was something I never really learned to play well. That comes down to lack of opportunity to practice followed by lack of motivation. But the idea is solid enough. You’re given a squad and you move in turn-based increments, making slow, tactical movements across a map until you finally break through the enemy force through superior planning. Which is all fine. It seems like a perfectly solid formula that could lead to another fun but challenging turn-based outing. 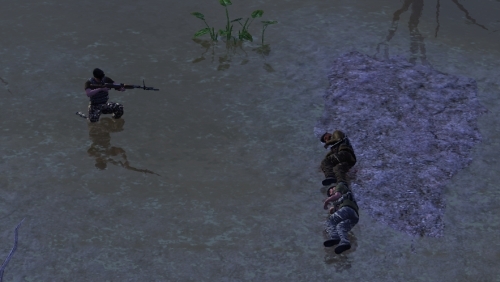 Jagged Alliance – Back in Action, for no real reason, is a real-time strategy game. Which immediately throws something of a spanner into the works. RTS mechanics thrive on simple choices presented in a straightforward fashion. You’re not carefully sorting between multiple movement modes and perusing your inventory, you’re clearing a path and making snap decisions based on the state of the battlefield. Back in Action compromises by giving you access to a battlefield pause-and-queue system akin to any number of other games that can’t quite decide if they want to be turn-based or real-time, with the added benefit here that you need to constantly be pausing and babysitting your mercenaries to try and get even the simplest objectives cleared. On its own, the queue system isn’t horrible, and it lets you do things like have individual troops hold their fire until everyone’s in position. I appreciate that. What isn’t clear is why the game needed to swap over to a real-time system in the first place, which makes the whole thing feel like a mess at a glance. I should note that the entire point of lockpicks is, you know, picking locks. I know, you need to have control over the flow of the game, but when you’re going to create all of these options don’t then try to take them out of my hands. Seriously. At any rate, the tutorial is functional enough, if rather bland. The demo mission, on the other hand, throws you straight into what I can only decipher is the middle of the game with a mixed squad whilst giving you no clearly displayed objectives. There are a whole lot of enemy soldiers helpfully highlighted, and the loading screen seems to indicate that there’s a secret laboratory in the jungle, and… probably I should kill all of the gentlemen guarding this base? Yes? That seems like the thing to be done? I’m sure there’s a way to do it. I’m sure that the developers had great ideas about how one goes about laying ambushes and slowly picking out targets, drawing guards away and picking them off one by one through a combination of stealth, aiming, and tactical movement. And that does sound like fun, really, as I’ve done similar things in any number of other games. A sort of squad-based Metal Gear Solid sounds like a good ride. There’s obviously a great deal of thought put into all of these elements, but rather than using the demo as an opportunity to show off what the game is capable of providing, it instead shows off how obtuse and impenetrable the game can be. Finally managing to take out one group of enemies took quite a bit of doing and still left me with one seriously injured squadmate. The fact that the whole thing is a confusing jumble of turn-based and real-time doesn’t help matters, either, as you wind up with carefully planned maneuvers that come apart… and then you have to pause, start giving new orders, but wait that one’s still following the old orders, let’s go and fix that, but wait, I don’t recall what I wanted this to do, and oh forget the whole damned thing. A bit of research reveals that people were not tremendously pleased with the full game either, and I can see why. The demo, at best, is tailored for someone already intimately familiar with the franchise, but considering the drastic reworking of the game’s core systems it seems that it’s mostly tuned for people who are already old hands at the game. Far from thinking that the full version could be a fun ride, I’m left thinking that the full version would be a tedious exercise in micromanagement that might eventually reward me with the stated premise of running a paramilitary organization. And really, if I wanted to spend hours bogged down in tedious micromanagement just to eventually get into an exceedingly dangerous and not terribly satisfying firefight, I’d join the actual military. At least that makes money.